What’s the use of books, … or libraries, in the information age? Libraries now offer themselves as tributes to the book, entertaining the fantasy speculation of librarian and novelist Jorge Luis Borges: “I know of districts in which the young men prostrate themselves before books and kiss their pages in a barbarous manner, but they do not know how to decipher a single letter” (85). 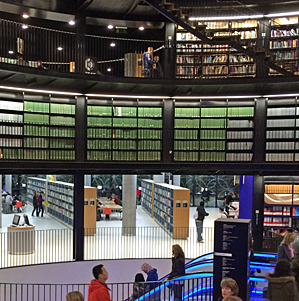 I was tempted to think of books and cargo cults as I visited the new Birmingham Public Library by Mecanoo Architects. I was there on a busy Saturday not long after the library’s official opening. It’s in the heart of the city’s cultural and entertainment district, and was busy with visitors ascending the tubular interiors of this lopsided zigurat to survey the city from height. Easy to miss, there’s also the Shakespeare Memorial Room up there, the remains of the old Victorian library inserted into the frame of the new. 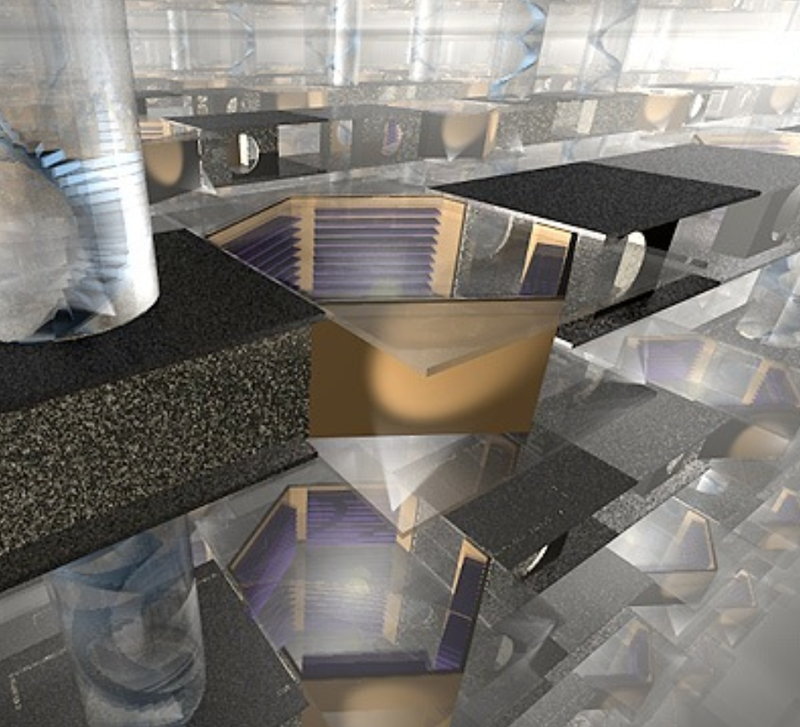 The vertical references to the Tower of Babel are obvious to critics and architects, and perhaps also to visitors, readers and those seated at the many computer screens with the World Wide Web at their fingertips. The building is also Borges’ Library of Babel in microcosm. Like the Internet, Borges’ library is difficult to represent, partly due to some geometrical ambiguities, or perhaps impossibilities. Here are some attempts by students several years ago. There’s another series of cargo cultish representations of books in the computer game Uru (Cyan Worlds Inc): such as the massive rotating hexagonal fortresses for “maintainers” and writers in the Age of Gahreesen, as explored indefatigably by LP expert Sven Groot of the Guild of Let’s Players. But then intellectual life, and reading, is a bit of a game according to Existential novelist Hermann Hesse. The only way to learn the rules of this Game of games is to take the usual prescribed course, which requires many years, and none of the initiates could ever possibly have any interest in making these rules easier to learn. These rules, the sign language and grammar of the Game, constitute a kind of highly developed secret language drawing upon several sciences and arts, but especially mathematics and music (and/or musicology), and capable of expressing and establishing interrelationships between the content and conclusions of nearly all scholarly disciplines (14-15). Borges, Jorge Luis (1970). The library of Babel, in Labyrinths: Selected Stories and Other Writings, ed. Donald A. Yates and James E. Irby, Harmondsworth, Middlesex: Penguin, 78-86. Hesse, Hermann. 1990. The Glass Bead Game. Trans. R. Winston, and C. Winston. New York: Henry Holt and Company. First published in German in 1943. Prizeman, Oriel. 2011. Typology Quarterly: Libraries. The Architectural Review, (November) (subscriber content). I take Borges’ essay The Library of Babel in its obvious sense as an allegory of different philosophical positions. There are the idealists, relativists, nihilists, fundamentalists, cosmologists, etc. As he suggests in a footnote it’s a melancholy journey. 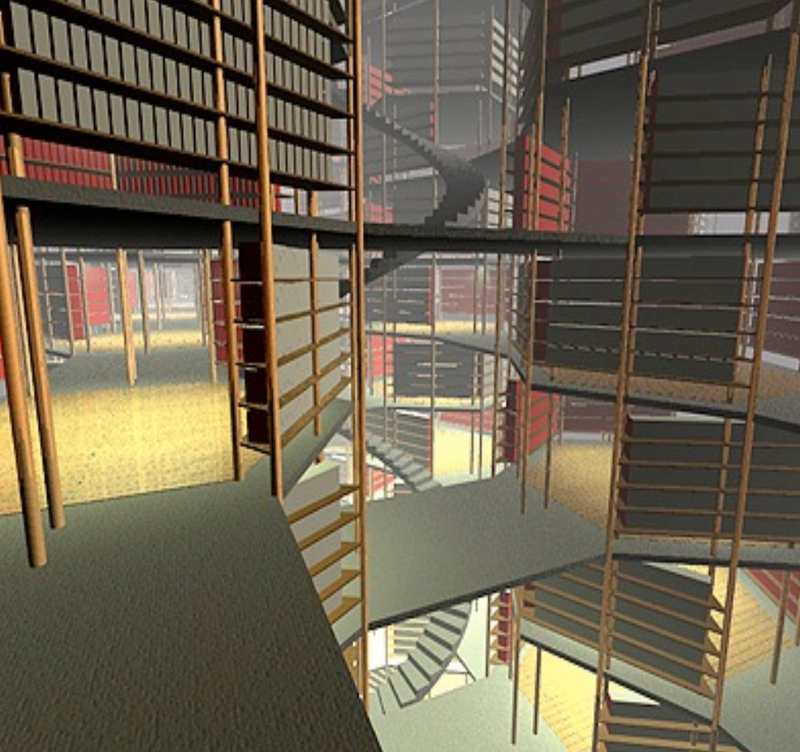 The narrator went into the labyrinth of “corridors and polished stairways without finding a single librarian” (81). If you are an author of either of the two Library of Babel images then please let me know and I’ll credit them. They are by students of the MSc in Design and Digital Media from about 8 years ago. 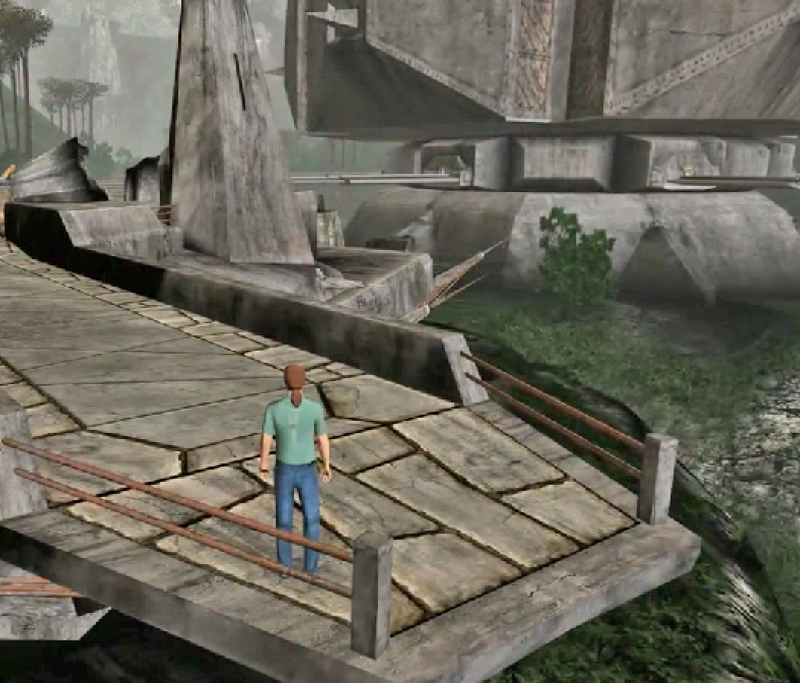 The games of Myst and Uru are of course about books that link (hyperlink) you to different places, and environments that appear physically once they are described in writing, literally. The game is not all puzzles and visuals. There’s a lot to read as well. Also see Almost to infinity, and Circles and how to get out of them. An additional thought: I was reading about the library and I realised that the old brutalist building of John Madin is about to be demolished. The Mecano’s building opening and simultaneously the demolition of Madin’s brutalist building (the two different but officially approved architectural approaches) may also imply something about the changing “cult of the book” through time and the buildings it has inspired. Thanks Dimitra. I hadn’t realized the old building was going to disappear. No doubt architectural tears will be shed. It too contains a big atrium, and the ground floor has shops and eateries. According to Madden it was to be a flexible and adaptable building and could be modified to contemporary needs. Perhaps if it was round like The Bullring Centre in the midst of the city’s redevelopment it would have been spared. Do round buildings stay around longer? I never thought of that to be honest, but when it comes to brutalist architecture, perhaps the circular shape is not enough to justify the decision made. e.g they are also demolishing the Prentice Women’s Hospital in Chicago, which could be very loosely identified as “round”. I guess it’s also about the material. Exposed concrete hasn’t stood the test of time, especially in the damp UK climate. Concrete seems to survive better when “bleached” by the sun. Madin’s concrete pre-cast panels could be re-surfaced. Anyway, the fortress metaphor fits old ideas of the archive. Contrary to the upbeat commentary in the video about the South Bank being bereft of windows, much architecture is now about transparency. It’s an open book perhaps. Although I enjoy the feeling and the smell of old decaying stacks of dusty books, I think that it is inevitable that services such as libraries and cinemas will decline in popularity. They like everything else will just have to adapt to the constantly changing technologies. A simple idea being turning into a digital library. But the fact is the library has no more to offer. Nearly all literature is available online. I do still go to the library for their quite study zones and printing services, but not for information held on their shelves. It’s interesting that the feeling, the sensory experience and perhaps the being with other people, seem to have contributed to the survival, or revival, of the cinema in the face of often-predicted decline. See e.g. Whether anything about the experience of being around books should lead us to expect an eventual revival of the fortunes of the library … who can say?